The fourth and final Deutsche Bank junior banded tournament took place last weekend with a number of strong and notable performances across the day. Band 2 was hotly contested, with Callum Gilson eventually coming out on top. It was an incredibly close affair and Gilson didn’t have it all his own way. Suffering a 3-0 loss to Amy Wesley who ultimately finished fourth left the group with little to split the players between first and fourth. Caden Brouard put in a good performance to finish as runner up. Max Burrows showcased the progress he has made this season, holding off Shelby Timms and Zaheer Anees to claim the Band 3 title. Timms and Anees had a hard-fought battle for second place, with Timms edging out Anees in 4 sets. Band 4 saw James Crocker demonstrate why he will be playing in higher bands next season, putting together an assured performance to claim the title with relative ease. Tia Timms also had a solid day, with her loss to Crocker being her only loss on the day. Henri Whitehorn swept all before him, only dropping one set on his way to the band 5 title. Daniel Lasenby took second place with a strong performance in which he only lost to Whitehorn. Young Alex Jakubowski from Alderney was awarded player of the day for her efforts. Jacques Bideau was undefeated on his way to the band 6 title, though he faced stern opposition from Ridunians Isaac Maurice and Grace Milan who finished second and third respectively. Band 1 saw a shock with Billy Ogier putting in a strong performance to finish second. This was in part due to the fine performance from Ryan Gilson who thwarted Dan Collenette’s ambitions with a surprising 3-0 victory which elevated Gilson up to third and relegated Collenette to fourth. Ben Foss ultimately prevailed, claiming the title, in a closely fought match with Ogier. The 3rd Deutsche Bank junior banded tournament of this season took place on Saturday afternoon at the GTTA Centre. Although slightly down on numbers due to illness and other commitments, 32 junior players between the ages of 9 and 18 took part including 7 players who travelled over from Alderney. Ben Foss took the honours in the top Band, courtesy of wins over the other five players, although he was pushed hard in a 5 game win over left-hander Ryan Gilson. Band 2 produced some of the most spectacular and hard-fought matches with Caden Brouard eventually coming out victorious on countback over Ben Sharp. James Crocker showed his recent improvement with some excellent attacking shots and was unlucky to lose narrowly to both Brouard and Sharp to finish 3rd. He was awarded Player of the Day for his efforts and it surely won't be long before the trio are challenging in Band 1. Erin Vaudin showed steely resolve to come out top of Band 3, fighting off older more experienced players Robert Naftel and Josh Crocker. Vaudin did lose in the last game to the improving under-11 player Jayden Tucknott, but beat Naftel on countback. Alderney's Megan Simonet came top of Band 4, her only defeat coming to fellow Ridunian Isaac Maurice, while Evan Lesbirel's experience playing in the Senior League has been evident in his excellent second place. Alderney have lot of talented young female players and this was on show in Band 5 as they took the top two positions with Hollie Jenkins pipping Sian Craig to the title. Two names to watch out for in the future. 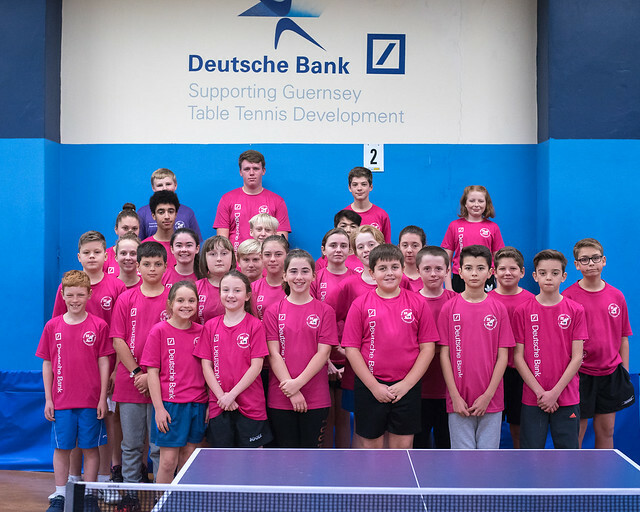 Another good weekend of table tennis at the Guernsey Table Tennis Centre saw 42 juniors take part in the first Deutsche Bank junior banded tournament of the season. Band one saw Ben Foss, take the title with Matthew Casey earning second place. Foss has been the dominant force in junior table tennis in recent years and that was reflected in the results on the day. Foss didn’t have it all his own way though as Billy Ogier recreated David & Goliath and managed to secure a 2-1 victory over Foss. Band two was an incredibly tense affair with Caden Brouard, Callum Gilson and Ben Sharp all being in contention during the final round of matches. It was Gilson who managed to come away with the title, edging Ben and Caden into second and third respectively. Max Burrows took the band three title with an assured performance, with Tia Timms and Josh Crocker being the only players to take a set off of him. Tia won all of her other matches, thus wrapping up second place. Band four saw the rapidly improving Zaheer Anees take the title, winning all of his matches in the process. Zaheer and Jayden Tucknott had a very close match with Zaheer winning 12-10 in the decisive end which ultimately won him the band and forced Jayden into second place. Band 5 saw Jacques Tautscher play with a maturity beyond what was expected of a player who has only been playing a short while, dominating band 5 with no other player taking more than seven points in a game against him. Courtney Benfield beat Nicole Le Noury 2-1 in a close match which ultimately led to Courtney taking second place. Jacques Bideau claimed the band 6 title by winning all of his matches 3-0, with Daniel Lasenby taking second place. Nicole Le Noury was given the player of the day award.